If one was ever a Garth Brooks fan, they’re about to become an even bigger one. Brooks dropped his new live album, Triple Live, to fans for free this week via a Ticketmaster promotion, but it doesn’t stop there. The free version is a “Fan Mix” that allows fans to take control of the sound by changing the balance on their speakers. I’m not sure how many fans have speakers that allow them to adjust the balance, but the feeling I got while listening with a pair of headphones is submersible. The band is on the left side with the crowd on the right and it put me right in the center of the arena. It was like I was there and reliving my Fresno experience all over again! Because of this, Triple Live has a more real feel than his previous live efforts. 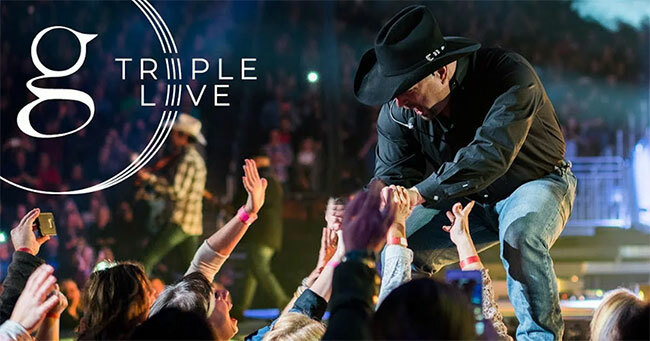 Triple Live features key moments from Brooks’ three year North American tour with Trisha Yearwood that ran from 2014-2017 and playing nearly 400 shows. The Fan Mix is a digital download only that features 26 tracks from the trek. This brings each “disc” running about 34-40 minutes (shorter than his 21x platinum Double Live that covered his 1996-1998 tour), but Brooks promises additional tracks will be included on the physical version that will be released to retail this fall, so I’m expecting three discs packed with material. The album features a mix of old, new and cover songs. Staples one can always expect to appear on a Garth Brooks live album include “The Thunder Rolls” and “Friends In Low Places” in their extended forms, “Ain’t Goin’ Down (‘Til The Sun Comes Up),” “Callin’ Baton Rouge,” “Shameless,” “The Dance” and more. New songs include his most recent No. 1 “Ask Me How I Know,” “Whiskey To Wine” with Yearwood and “Mom,” among others. Covers include a rousing rendition of Ashley McBryde’s “Girl Goin’ Nowhere,” aptly titled “Boy Goin’ Nowhere,” George Strait’s “The Fireman” and the Nitty Gritty Dirt Band’s “Fishin’ In The Dark,” the latter which was previously released as a studio recording. As with its predecessor, there are fade outs between each song, causing discontent with many fans, but this doesn’t bother me. I like the idea of having songs from different shows to capture the energy better. Oftentimes, live albums that are from a single show fall short for various reasons. However, Triple Live is all fun and high packed energy and is one big sing-a-long. Plus, several of the songs included weren’t performed during the early part of the tour, let alone every night, so this is a good mix live music from the six time CMA Entertainer of the Year winner, and the reason he should’ve been nominated and win for a seventh time!